The giveaway is closed! Congratulations to Linda in New Mexico!! Send me your contact info within 48 hours to claim your prize. Thanks for participating y'all!! Iced tea and iced coffee have been a "hot" ticket beverage item around this house the past few weeks with this extended heat wave. I am very grateful for my central air conditioning right now and c'mon fall is about all I can say about that! Well... to celebrate the end of Deep South Dish's 1st birthday week, I thought that I would host another giveaway courtesy of MyBlogspark and Macaroni Grill, that will help to get you out of the kitchen quick! First off, I'm a big fan of easy skillet dinners, and especially ones that involve pasta, so I was excited to try the new Macaroni Grill Grilled Chicken Florentine frozen entrée. We don't have a Macaroni Grill Restaurant where I live, so it's nice that Romano's Macaroni Grill is offering four new frozen entrées available right at your supermarket! 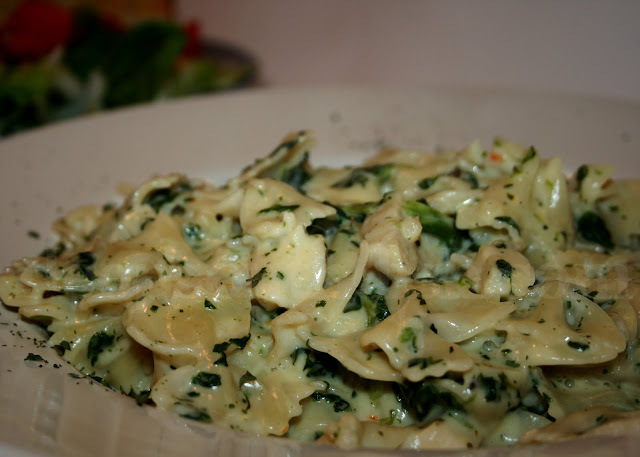 This entrée contains grilled white meat chicken and spinach with farfalle bow-tie pasta, tossed in a delicious creamy Parmesan cheese and garlic sauce. It's the perfect size for two adults. And let me tell you. Nothing could be easier. 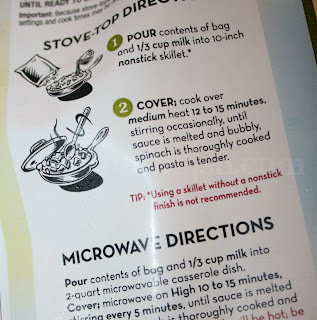 Just literally dump the package in a microwave safe covered casserole dish, or a non-stick skillet, add 1/3 cup of milk - cover and cook for about 15 minutes. That's it! The flavor of this dish is so fresh and yummy y'all that nobody will know it came out of a package from the freezer. Even my non-veggie eating husband - who wouldn't knowingly touch spinach if his life depended on it - gobbled this dish up and declared it "delicious." If you know The Cajun, you know that means this dish was a winner for sure. I can't wait to try the other varieties! Macaroni Grill frozen entrées are available now in your grocery store's freezer section and there are several to choose from. Now you can enter for a chance to try it for yourself! One winner will receive a Macaroni Grill prize pack that includes one Macaroni Grill Frozen Entrée sample (may be different from this one), in addition to a serving bowl and pasta tongs. Pop over to Macaroni Grill at Home, come back and leave a comment and share which Macaroni Grill frozen entrée you would most like to try ~OR~ name another favorite Italian meal in the comments that you would love to see Macaroni Grill add to their frozen entrée lineup. Be sure to grab a coupon while you're there! Please note: To enter you must be at least 18 years of age. If you don't have a Twitter account, you can also SHARE this link on your Facebook page, in an individual post on your blog, or at another community/networking page to earn the extra entries. Follow Macaroni Grill on Facebook and Twitter for the latest news and special offers from Macaroni Grill. ➮Giveaway closes on Sunday, August 15, 2010 at 12:00 noon CST. ➮You must be at least 18 years of age to enter. Disclosure: Macaroni Grill provided me with the free product, information, and prize pack through MyBlogSpark. I haven't seen these yet. I will look for them. 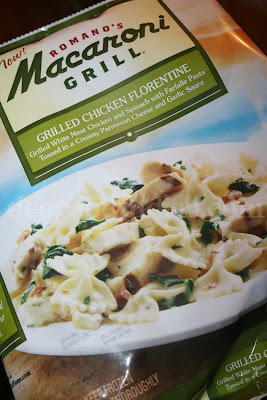 I would love to see MG add Pasta Milano to the frozen entrees. That is my favorite! Roasted Garlic Shrimp Scampi and a dollar fitty off coupon, plus I get to enter one of your fabu contest....whooo hooot, good Sunday afternoon to you Ms. Mary. You sure do know how to make it all worth a body's time sweet girl. Basil Parmesan Chicken; we love basil; also love Macaroni Grill. Omgosh the grilled chicken florentine looks AMAZING!!!!! We also like the baked MG dinners...The Chicken Marsala is our fave! Thanks for the posting and contest. MG is my FAVE!! The closest one is 100 miles away, but we always go for my b-day each year! If they'd only come out with a box something or nother for that Lemon Passion Cake!! Ha Ha! I haven't seen them yet, but will look. I want to try them all. They look sooooo good. Especially the chicken florentine and the shrimp scampi. I just can't make up my mind. Guess I will have to try them all. Love your page and all the recipe's you post. You must be a mind reader! I was in the store today and saw these and decided to come home and look for a coupon. The grilled chicken florentine looks wonderful. The Grilled Chicken Florentine sounds great. I would love to try soon. The Basil Parmesan Chicken looks great. We have Macaroni Grills in the area and they are very good. I'd love to try the spicy italian sausage pomodoro. I shared this via a post on facebook. The nearest Macaroni Grill is in Dallas. So I will be looking for these in the store. I will start with the Roast Garlic Shrimp Scampi. Coupon in hand. I think I'd like to try the roasted garlic shrimp... sounds yummy! Oh yummy that pasta looks great. I havent seen that one yet and pasta is my weakness. Great giveaway Mary. The grilled chicken florentine looks wonderful. Well,dang, where have I been? I only just saw Macaroni Grill dinners on the non-refrigerated shelves and now they have frozen, too? I really need to snap out of my tunnel vision in the grocery store! :) That Spicy Italian Sausage Pomodoro caught my eye ... we are all about pasta with red sauce in our house! Grilled chicken florentine sounds fantastic. Thanks for the giveaway. Roasted Garlic Shrimp Scampi sounds awesome. I got a coupon and will have to look for these. These sound delicious! I'd be torn between trying the Florentine or basil first! We have a Macaroni Grill here and it's one of the few restaurants we like to frequent. But doing it at home with these entree's, you are missing out on getting to draw and doodle all over the paper table clothes :) I love getting to do that. I follow you on twitter and I totally tweeted girl.. I havent tried these but they look so great. I am a college student so freezer meals = helpful! Sorry for the delay folks - been having a computer meltdown and trying to recover files. Will announce the winner soon!